I remember when thermogenic supplements first became popular about 10 years ago. Then, they were mostly just fancy capsicum (pepper) capsules. You’d sweat like crazy, metabolism would rev up and appetite diminish. 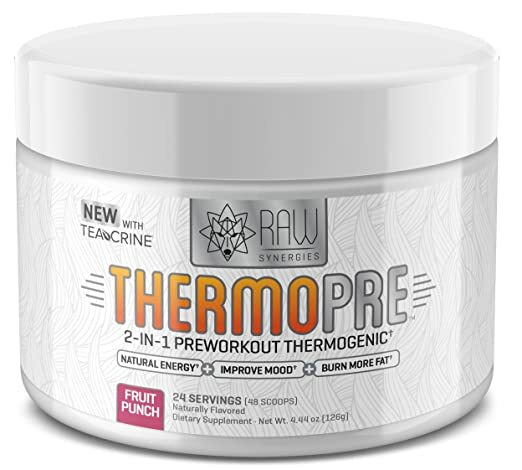 There is a now new trend of thermogenic pre workout supplements. There aren’t too many of these thermogenic pre-workouts on the market yet. However, I suspect that will change as people become aware of what thermogenesis can do for them. Remember that there is no “perfect” workout supplement. To lose weight and get tone, you must exercise! With that in mind, here’s what you need to know about thermogenic pre supplements before you decide to take them. 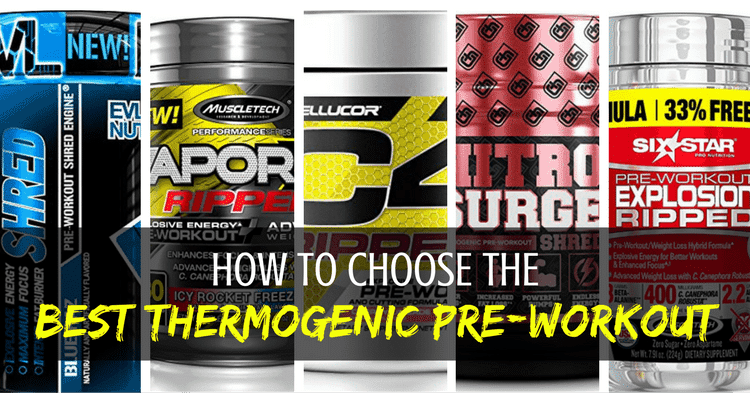 What Are Thermogenic Pre Workout Supplements? What Ingredients Have a Thermogenic Effect? Pre workout supplements are designed to give you energy so you can workout harder and longer. Good pre workouts will also have benefits like boosting mental focus, building more muscle, and increasing metabolism. 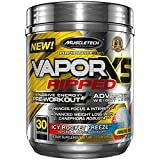 If you aren’t familiar with pre workouts, I suggest reading this guide to pre workout supplements. Thermogenic pre workouts are a specific subset of the supplements. They still give you the same energy and focus boost as pre workouts, but contain ingredients which increase your metabolism through a process known as thermogenesis. In simple terms, thermogenesis is the process of making heat through metabolism. For example, we use food as fuel to heat our bodies. This is why we get hungrier in winter. We need more food to keep our bodies warm in the cold weather! One of the best analogies of how thermogenic supplements work for fat loss is to think of a thermostat. The higher you turn up the thermostat, the more energy is used. Depending on the temperature and your body, approximately 800-1000 calories per day go towards maintaining your body heat.2 Even a slight increase in thermogenesis can result in many more calories burned. Unlike many other types of energy expenditure, thermogenesis specifically causes fat to be burned. As if this weren’t good enough, thermogenesis also decreases appetite, which can help you eat less and lose even more weight. Thermogenics and pre-workout supplements can have a lot of the same ingredients (like caffeine). However, they are fundamentally different. If you want to workout harder AND lose more fat in the process, then take a thermogenic pre workout. When reading the labels of thermogenic pre workout supplements, you can have a hard time figuring out which ingredients are for thermogenesis and which ones for energy. There are too many ingredients to cover them all, but here are the main thermogenic ingredients you’ll find in supplements. Caffeine doesn’t just boost energy (which will help you workout harder so you burn more calories). It actually causes your body to release more fat while keeping muscle mass intact. Of course, too much caffeine for extended periods can negatively affect your nervous system. It is important that you are actually working out hard to burn off the caffeine. Otherwise, you’ll be feeling jittery and nauseous. Green tea contains caffeine, so it has a thermogenic effect in this way. However, the weight loss benefits of green tea go beyond just the caffeine. Conjugated linoleic acid is a fatty acid found mostly in animal products. It is popular because of its proven ability to target fat deposits. It mostly works through thermogenesis to increase metabolism, but also has many other benefits. This is one of the best known thermogenic supplements. Anyone who has eaten chili peppers knows how they can increase body temperature! You will generally need to take the supplement 30 minutes before exercising. This is adequate time for the supplement to kick in. One of the benefits of thermogenic is that they will increase the amount of calories you burn not just while working out, but after your workout too. The body continues to burn calories after you’ve stopped exercising. This burn is referred to as excess post-exercise oxygen consumption. However, a number of calories burnt post-exercise varies depending on how you exercised. Start slowly by taking a ¼ or ½ dosage. If you don’t feel symptoms and need a bigger effect, then you can gradually increase to the full dosage amount. I’m not aware of any evidence which shows that thermogenics like cayenne will lose their effect after using them for a long time. However, your body will start building up a tolerance to caffeine. Do not increase your dosage as this will only increase your tolerance to the stimulants. Once you’ve gotten used to exercising on 4 scoops of pre-workout, it is hard to go back to exercising without the pre workout boost. Thermogenics increase your core body temperature and help you rev up metabolism. You will notice that they cause you to sweat a lot more than normal. If you aren’t careful, you risk becoming dehydrated from thermogenic pre workout supplements. Dehydration negatively affects performance, which counters the benefits you should be getting by exercising. Be sure you are drinking at least 1 gallon of water per day. This one also made our list of best pre workout supplements for women, especially those who do a lot of cardio to burn fat. The reason it is so popular (with men and women alike) is because of the ingredients which specifically target fat. A lot of fat burning pre workouts mostly contain caffeine. 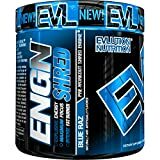 With ENGN Shred, there is a decent amount of conjugated linoleic acid (CLA) and cayenne, both of which boost metabolism through thermogenesis. You also have ingredients like vitamin B and huperzine A to improve focus. Ingredients like choline bitartrate help improve muscle formation. Best For: Because of its emphasis on energy and focus over muscle development, this supplement is best for people who do a lot of cardio. 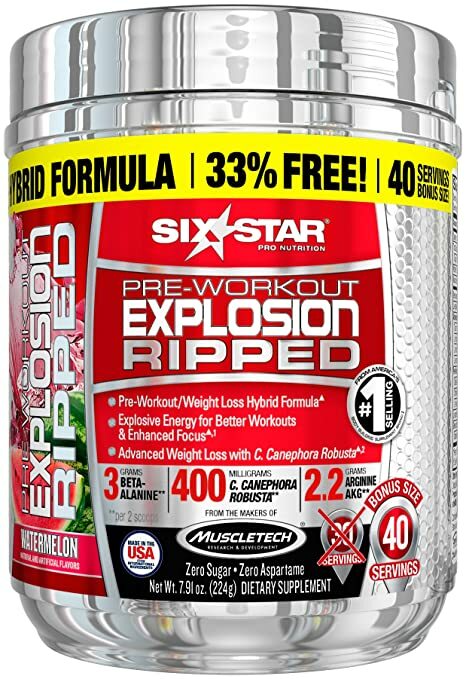 Six Star Explosion Ripped is one of the cheapest thermogenic pre workouts on the market. The reason it is so cheap is that its main ingredients are just forms of caffeine. Don’t be caught up with their claims about the benefits of c. canephora – it’s just a fancy name for coffee beans! Caffeine and L-carnitine are the only thermogenics in the supplement. However, the supplement does have a good amino acid profile, which can help people doing weightlifting get better benefits. Best For: People who are looking for a cheap pre workout supplement. 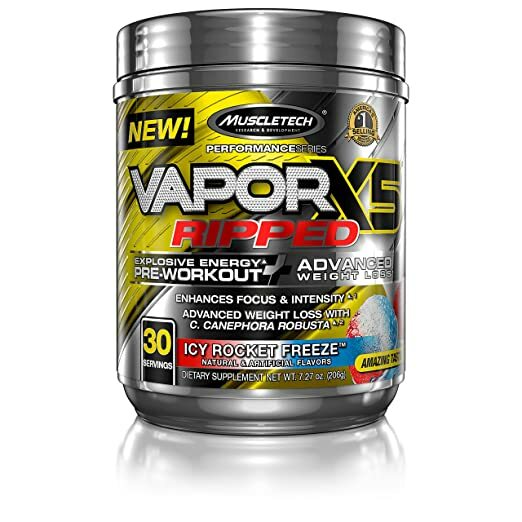 VaporX5 by MuscleTech is mostly a pre workout, though it does also provide a thermogenic effect as well. It is one of the more popular supplements. Most reviewers love it because it gives them energy without making them feel jittery. The key to this supplement is that it provides energy from more than just caffeine (which is just about 240mg per scoop). The choline, L-theanine, and galangal extract are great for boosting focus. Note that this pre workout does contain creatine. People whose primary goal is weight loss don’t always like creatine because of the bloating it can cause. You might want to check out these pre workouts without creatine. Best For: People whose primary goal is getting pumped, not losing weight. It is refreshing to find a supplement with such a short ingredients list. 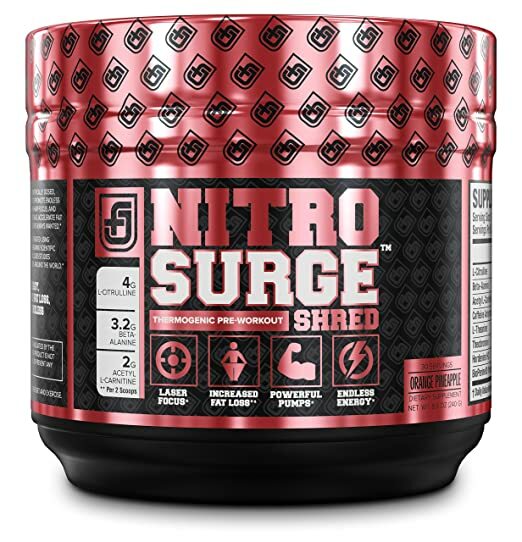 Instead of adding a lot of bogus ingredients, NitroSurge Shred focused on a few quality ingredients. There is 190g of caffeine in the pre-workout. However, it also contains theobromine, which is the stimulant found in cacao. Compared to caffeine, theobromine has a much milder effect on the central nervous system. It is also scientifically shown to improve mood and alertness (good if you are having a bad day!). The hordenine in the supplement is another energy booster and fat burner. 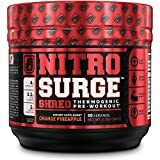 You’ll also find L-carnitine (thermogenic), L-citrulline (improves nitric oxide production), beta alanine (for power and strength), and Bioperine (for increasing absorption). Best For: People who both cardio and weightlifting. Also good for people who don’t handle caffeine very well and want a stimulant with milder effects. ThermoPre is a lot different than most other pre workout supplements. For starters, it is actually focused on increasing metabolism and not just loading you with stimulants like caffeine. While you will get a good amount of caffeine from the supplement (250mg per dose), it is also the capsicum, yerba mate, and L-cartinine which helps fat burning. The combo does a great job of suppressing appetite. Beta-alanine helps improve performance so you can do intense workouts. ThermoPre is one of the few thermogenic pre workouts without artificial dyes and sweeteners. If you are interested in going the all-natural route, check out these organic pre workout supplements or all-natural pre workout powders. Best For: Stressed-out people who want mental clarity as well as energy. 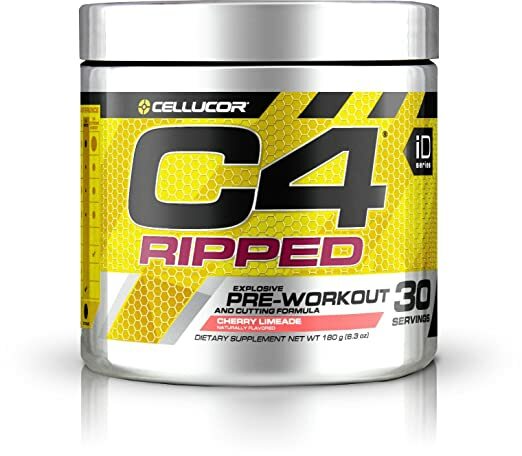 C4 Ripped is one of the most popular pre workouts on the market. It will definitely make you feel buzzed, which isn’t a surprise considering how much caffeine is in the product. There are also some other good ingredients for boosting performance and focus. However, this is mainly a stimulant product. Don’t be surprised if you feel tingly after taking it. As for the fat-burning thermogenic effect, C4 Ripped has capsicum and l-carnitine which will boost your metabolism. The high dosage of beta alanine and arginine aren’t really necessary, but people who do weight training will appreciate the added boost these provide. 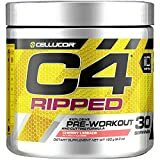 Best For: People who need a powerful pre workout supplement to support weight loss. 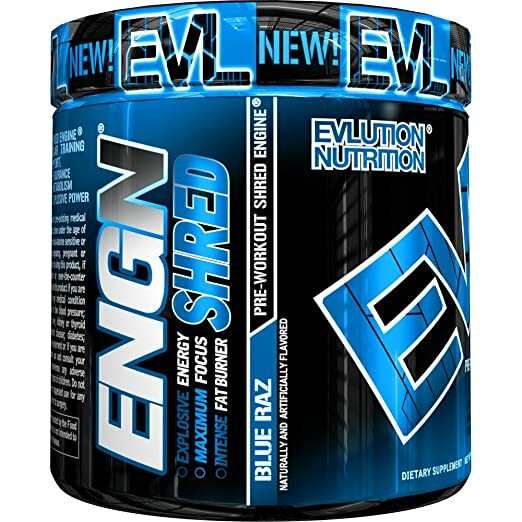 When it comes to delivering energy and promoting fat-burning, Evlution Nutrition ENGN Shred wins because of its solid ingredient profile and affordable price. If you are looking for something milder in the energy department, then try out ThermoPre. You’ll appreciate its stress-fighting ingredients and how it revs up your metabolism.